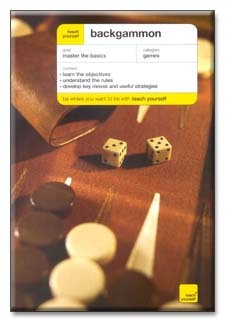 COVER: Are you new to backgammon and want a basic understanding? Are you a novice player who wants to improve? Do you want exercises to help you learn and win? Backgammon is a full and informative introduction to this enduring board game. It start by explaining the object of the game, then works backwards to explain how to get there. It offers a step-by-step guide to strategy, with key tips on what moves to make when. Interactive exercises allow you to perfect your technique, and there is plenty of information on rules, tournaments and the latest software. AUTHOR: Michael Crane is the founder-director of the British Isles Backgammon Association (BIBA) and one of the UK's leading experts on the game.